Christy and I decided to present you with both our ways of making Toad in the Holes. We first heard about these from an old black and white movie. Christy can probably tell you the name of it and who starred in the movie. I’m the type that watches a movie and never takes note of the title or actors. I just enjoy the action. That probably tells you that we are very different types of people in most ways. But in the way it matters most, we are the best of friends. Toad in the Hole is the recipe that I look forward to making for myself in the rare event that I am home by myself at breakfast. I guess since I have it so rarely, it has become something that I look forward to. My other indulgence is Stouffer’s Lasagna for dinner. As you can see, I am quite the gourmet. I thought that the way I make Toad in the Holes is the only and best way to prepare it. Because, as you know, mothers always know best. 😉 But then the young whippersnapper, Christy, lets me know that she has a better way, in her opinion. I love my way best because you have the little round hole which is toasted with butter and has a delightful crunchiness which is divine. She mashes her bread down in the center instead of cutting it out so she loses that. She loves her way because it is quicker and easier to prepare. Two hardheaded women trying to reinvent the wheel. I am going to walk you through both ways and let you decide which you prefer. We’d love to hear from you. Either way, the world will keep turning and we will keep cooking. Christy’s note: The first movie we saw it in was black and white but the second movie was a Betty Grable one, Moon Over Miami. I don’t call it “Toad in the Hole”, I call it “Gas House Toast” because that is what they called it in the movies, lol. I love old movies, far better than anything made today. When I lived at home we had two old movie channels and if I was ever watching television, it was on one of those. Mama was the only person in the family who would walk by, take an interest, and sit down to watch them with me! And I’ve always felt that my mother does everything perfectly. That’s just the thing, though! I knew, growing up, that I could never be as perfect as I viewed my mother to be so I just threw perfect out the window and figured I’d do the best I could and make sure I enjoyed the process as much as possible! That is why my way is a little less maintenance than Mama’s, but hers ends up prettier ;). I’m good with that! Now back to Mama. Step one: Christy’s way is to melt some butter in the pan and put the bread on top. 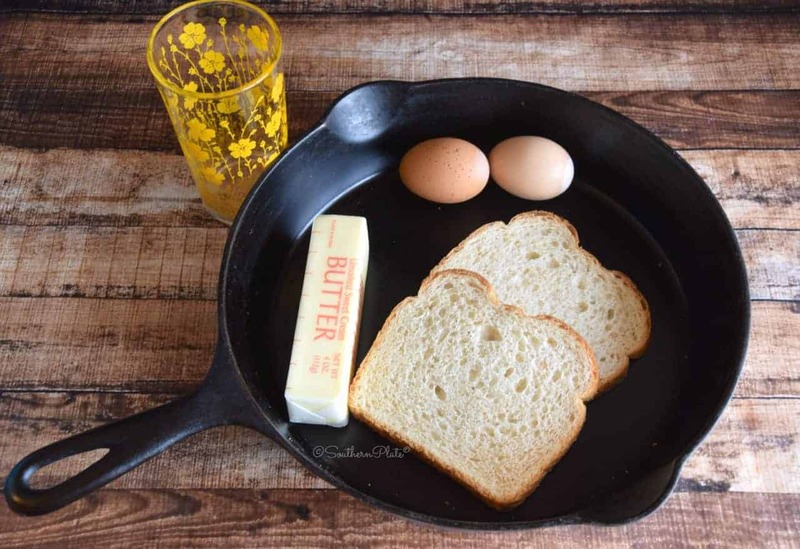 Mama’s way is to butter both sides of her bread all the way to edges and place into the hot skillet. Step two: Christy proceeds to mash the heck out of the center of her bread until it is nice and flat. Mama takes a small glass and cuts the center out of hers. Christy: I would not call that mashing the heck out of it, just pressing down a bit with my fingers to make a nice little cradle for my egg :). Step three: Christy leaves her bread to cook as it is. Mama removes the round center disc and sets it to the side to get nice and golden. Christy: Hey, it works and it’s one less step. Step four: Christy cracks an egg onto the mashed center of her bread to allow it to begin to cook. Mama cracks an egg into the center of her bread into the hole to cook. Step five: Christy just lets her egg sit and cook all alone but she does pierce the yolk a time or two. Mama breaks the yolk in her egg so that it completely fills the hole and the yellow is distributed. Christy: See Mama, all those times you complained about how messy my room was growing up, I was just trying to make sure the mess was distributed. Step six: Christy flips hers over and lets it finish cooking. Mama flips her Toad in the Hole and her round circle over so that they both continue to cook and get nice and crusty. See, while Christy’s Toad in the Hole may require a few less steps, Mama’s Toad in the Hole has the extra little crusty hole to enjoy. Which would you prefer? 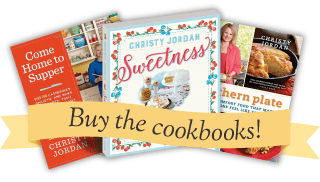 Christy: I don’t know about y’all, but I’d prefer the one that someone else cooked for me! I don’t care what you make or how you make it, if you’re cooking for me, I’m happy! A lot of people said that Christy got her love of cooking from me. While she probably did inherit that trait, she took it and ran with it. I was satisfied with old tried and true recipes and never deviated from the way I had always seen them prepared. She went to college and learned that it was okay to trade up ingredients and experiment with food. I guess I never tried it because money was scarce and I never wanted to take a chance on ruining a dish. I have since learned from Christy that it is okay to have fun with food. If you are short one ingredient, substitute another that you like equally well. You may be surprised that you like your way even more and maybe even develop a new recipe in the process. As long as your dish is made with love, your family and friends will enjoy it. Now take a look at both ways that we make Toad in the Holes and I’m sure you will agree that Mama’s way is best (just kidding!). If you decide that Christy’s is best for you that is okay too. Just remember to have fun in the kitchen. It is like a playroom for adults. Similar to playing with Playdoh but safer to eat. We look forward to sharing different ways that we prepare food with you! Have fun and remember Mama loves you. 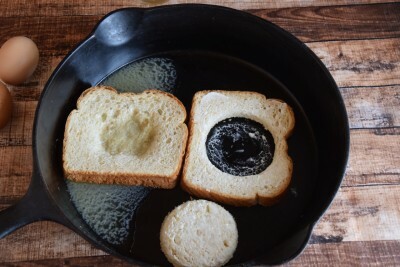 Melt butter in skillet and place bread on top. Mash down center of bread so that it will hold an egg. Crack egg into hole, salt and pepper and cook until bottom of bread is browned. Turn over and continue cooking until other side is browned and egg is of desired doneness. Butter each side of a slice of bread. 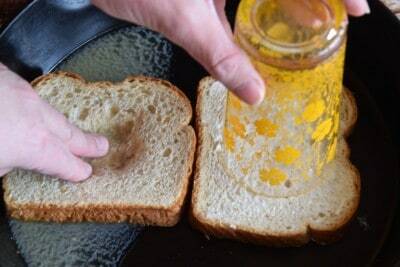 Cut center from bread using a small glass or cutter. 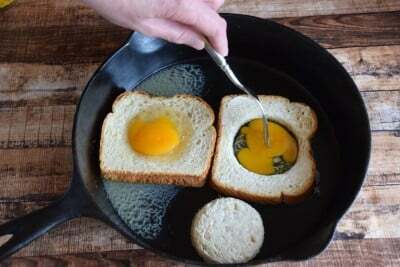 Turn Toad in the Hole and circle and continue cooking until bread is browned and egg is of desired doneness. Enjoy! I’ve made them for years and make them like Christy’s mama does. My girls love them. Changes things up a little from the normal eggs and toast routine. And aren’t they so good? You’ve got lucky girls! I make mine the way Mama does, but I don’t pierce the yolk. I like the egg to be over easy. The little toasted round is the best part and I love dipping it in the egg yolk! My daughters loved these when they were children. We called them Sunshine. I’ve also heard them called Bullseyes. I used to make these but haven’t thought of them in years. Thank you for reminding me again! Sorry Christy but I do think I would like Mama’s way best. Never have tried either one of these but hopefully can this weekend while home from work! Our family loves these. We call them Egg in a Nest. I have to say that I made these for my (now grown) kids the way your Mom did, except I did not disturb the yellow of the egg. I think we called these “eggs in a nest”. My kids loved them, and they have made these for their kids! Thanks for the memories ladies. We call them “Hole in One.” And I cut out my bread circle using several cuts with a tablespoon. We call it eggs in a nest here. I prefer Mama’s way because then I can have a little toast with jelly to go with the eggs in a nest! I always make them the way Mama does. I learned that from my Grandmother and I am now a senior. I also love the crunch. One in a very blue moon, I will make flat toast that I also learned from my Grandmother. Butter both sides of the bread to cover the edges. Fry til crispy brown on one side, flip over, squash bread flat, then cook second side til crispy brown. My grandchildren beg for these whenever I visit! I have always made this Christy’s Mama’s way, and the Grands enjoy the “bonus toast” from the cut-out bread. 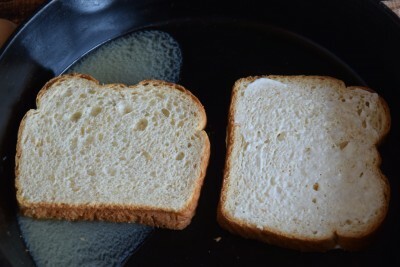 But as I look at the demonstration here, it stuck me–I can use the BOTTOM of the glass to smush down the bread instead of using the rim to cut out the hole. This way the egg white won’t want to run underneath the bread. A genius combination! Thanks, Christy and Mama! Love your method with the glass bottom. We love our ‘Hole in One’s’ with the yolk not broken. Of course, it isn’t really Toad in the Hole if there’s no hole! What Christy makes is Toad in the Hollow. lol But then, if you’re not using a toad, then it’s Egg in the Hole. I think I’m done now. I always thought they were made the way your Mama makes hers. I am going to make this for my husband. I thought the yolk was kept whole too, to dip the toasted piece in. My favorite way to eat egg yolk, lol! I do these occasionally, but I do them the way Mama Janice does. Her way makes sense to me because I don’t like the yellows of my eggs runny. I love the comment “two hardheaded women trying to reinvent the wheel”. Your post today is so uplifting. It sounds like the two of you were having fun! Thanks for this wonderful way to share with “blog” friends from around the world. I do it your Mama’s way with a smaller hole so the egg just fits in it. I also do not break the egg, we like to let it flowwwww out. It is usually a treat for my family as well, and adds a little variety to breakfast. I made these for all 4 of my daughters when they were growing up. Now I make them for my grand babies, and they love them as much as my girls did! My mama made “egg on bread” the same way your mom makes it Christy, except no fair breaking thr yolk! It was a favorite breakfast and sometimes quick dinner for my working mom to make her 3 kids when daddy was out of town. Now in my late 60’s, I still love my egg on bread! I make these but I add a slice of cheese to melt on top. My mom made these for me and my two brothers growing up. We called them eggs in a nest. I have to side with Mama on this one but I do not break the yolk. Just over easy when the bread is turned. A slice of melted American or Swiss cheese is a nice addition to the second side . I concur; eggs are always better with cheese….just about everything is. 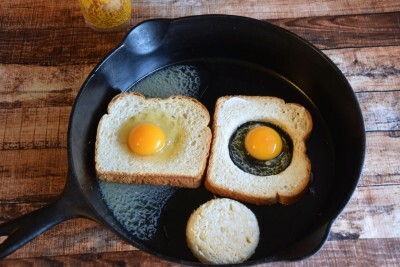 We call them one eyed jacks and keep the yolk runny to dip our toast in ….. a favorite for grands! I’m a mama and I make them like your mama does. Always a treat, especially with fresh baked bread. We call them “Egg in an Eye”. Yep, I make ’em Janice’s way..that toasty circle is the best part. I don’t purposefully break the yolk but may try that next time. I think this will be breakfast tomorrow! BUT…you’re BOTH Mammas so you’re right!! Mamma’s way is best! My lovely bride introduced me to these beauties but calls them a “sailor on a raft”. Perhaps it should be ” sailor in a raft” because we use your Mama’s method. If you use a knife rather than a glass you can make room for two sailors! And don’t be picking on those poor little eggs just leave them in one piece like they were created!!! Eggs are a gift from God. 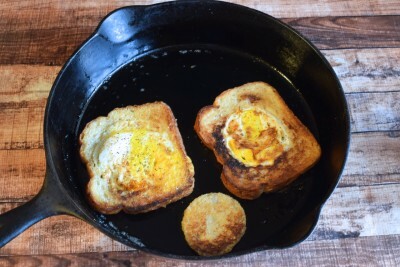 I always made my hobo eggs (aka; toad in the hole) Mama’s way. I always thought they were called hobo eggs because a hobo after hopping off the train he had jumped he swiped him an egg from someone’s hen house. I guess he bummed a piece of bread. My husband calls them One-eyed Egyptians. I have to say that I like your mama’s way but completely get it about wanting to do it the quick way. Come to retreat again sometime!